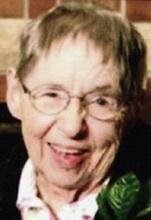 WATERLOO — Irma Bernice Brackin Barton, age 89, a lifelong resident of Waterloo, died of complications of Alzheimer's Disease Monday, Dec. 13, 2010, at Bickford Cottage in Cedar Falls, her home for the past three years. Survivors include three daughters, Patrice Dae Hudson (Greg) of Cedar Rapids, Judi Brackin (Jim Rhodenbaugh) of Waterloo and Teresa Hertges (Bob) of Elk Run Heights, also an "adopted" daughter, Mary Horslund of Waterloo; six grandchildren, Bryan Hudson, Jessica Dae Hudson (Tim Tolliver), Kevan Hudson, Melissa Leyen (Jon), Mary Hertges and Samuel Rhodenbaugh; two great-grandchildren, Macaulay Hudson and Mackenzie Dae Leyen; two brothers, William Bowersox (Lola) of Franklin, Tenn., and Ted Bowersox (Phyllis) of Hudson; a very special sister-in-law, Bonnie Ford (Donald) of Lake Forest, Ill.; a sister-in-law, Myrtle Brackin of Waterloo; a brother-in-law, James Herold of Casper, Wyo. ; and many nieces and nephews. Irma was born Nov. 8, 1921, at home in Waterloo, the daughter of William E. and Bernice Dae (Hixson) Bowersox. She graduated from Waterloo West High School with the class of 1939. She attended Iowa State Teachers College. She also studied at Gates Business College. Irma later graduated from Hawkeye Institute of Technology in Waterloo. She was united in marriage with Irvin L. Brackin on Dec. 2, 1944, at Westminster Presbyterian Church in Waterloo. He preceded her in death on June 26, 1966. Irma married Edward Barton in July 1974 at the Little Brown Church in Nashua. He preceded her in death in October 1995. Upon completing her education at Gates Business College, Irma worked in bookkeeping at John Deere. She then, during World War II, drove a city bus. She also worked at Hinson Manufacturing making seat covers until she and Irvin had their first child. The next 15 years of her life, Irma spent as a devoted homemaker. She was active in her church circle, volunteered as Brownie and 4-H leaders, and frequently served as room mother in the girls' elementary school classrooms. Irma was involved in the girls' activities and made many beautiful dance costumes for their recitals. Irma and Irvin thoroughly enjoyed antique shopping and scouting out good bargains. Their daughters were known, on occasion, to raise quite a ruckus in the backseat in hopes of distracting Irma and Irvin from an antique store sign down the road. Irma and Irvin then discovered the joys of rock hunting, finding and purchasing specimens for Irvin to use in his lapidary hobby. Irma's life changed dramatically on "6-26-1966" after Irvin lost his nine-month battle with leukemia. Irma had three young daughters to raise and knew, as she put it, "she needed a man's job to earn a man's wage." After obtaining special permission, Irma was the first woman to attend and complete the mechanical drafting program at Hawkeye. She found employment at Hinson Manufacturing where she worked first as a draftsman, then became their first numerical control operator and specifications manager. Irma worked at Hinson until they closed. After Irma's forced early retirement, she turned her time to breeding, raising and showing a championship line of French bulldogs. They quickly became her "babies." Irma achieved many accomplishments with her Frenchies, including showing one at Westminster. Irma was also very involved in her five grandchildrens' lives and various activities. When asked if she had any pictures, it was always a toss up if Irma would produce photos of her grandchildren or her dogs. Irma was one of the founding members of Pet Pals in the Cedar Valley and a member of the French Bulldog Club of America. She found great joy in taking her bulldogs on pet pal visits. She and Ed enjoyed planning and taking lengthy vacations around the United States. Devotional readings and prayer were an important part of Irma's life. Irma was a lifelong member of Westminster Presbyterian Church in Waterloo; a member of the Waterloo Chapter of the Daughters of the American Revolution and a 50-plus year member of Becker Chapter of the Order of the Eastern Star. Irma was preceded in death by her parents, her two husbands and 11 of Irvin's brothers and sisters. Funeral services will be held at 11 a.m. Friday, Dec. 17, at Kearns, Huisman-Schumacher Chapel in Waterloo, with burial in the Waterloo Cemetery. Public visitation will be held Thursday from 4 to 8 p.m. at Kearns chapel, where there will be an Eastern Star memorial service at 6 p.m. Visitation also will be held at 10 a.m. Friday at the funeral home prior to the funeral service. In lieu of flowers, Irma made her wishes known that memorials be directed to Pet Pals (c/o Cindy Ziegenhorn, 1103 W. First St., Cedar Falls, IA 50613) or the Eastern Iowa Chapter of the Alzheimer's Association (1570 42nd St. NE, Cedar Rapids, IA 52402). A special, heartfelt thanks to the loving, dedicated staff at Bickford Cottage, Cedar Falls, as well as the staff at Hospice Compassus and Cedar Valley Hospice.